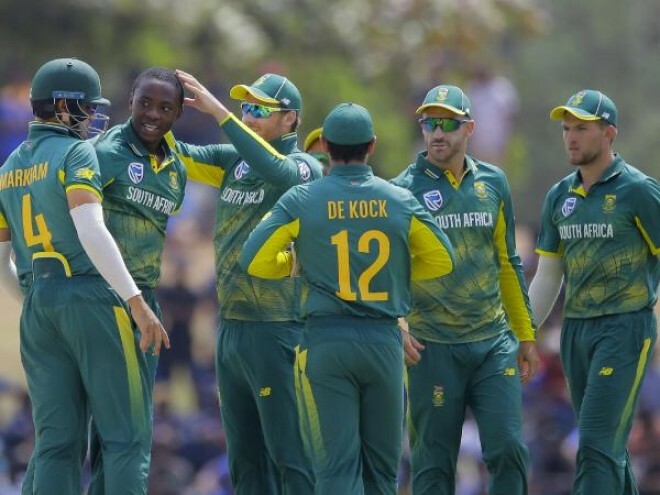 Centurion, March 6: A wounded South Africa bounced back to win the first ODI of this series against Sri Lanka by eight wickets. But at this point, results are almost secondary to the goal of identifying who the best limited-overs cricketers in the country are, and who will be going to the World Cup. What is South Africa's best XI in ODIs? This was the central question that CSA's selection policies set out to answer over the past year, with increasing urgency. There have been 10 debutants in the ODI side since 2018, to go with three new Test cricketers and seven players blooded in T20Is. Fast bowler Anrich Nortje is the latest on the list, picking up a solitary wicket on his first outing, albeit on a dry, slow and uncharacteristic Wanderers track. South Africa has undoubtedly unearthed some match-winners along the way, but the first ODI also gave a timely reminder of the value of some of the proven old heads. Now it is Sri Lanka's turn to bounce back. They were far from their best in all departments on Sunday, squandering a position of strength with the bat when they slipped from 195 for 4 to 231 all out, and then being unable to build on the early dismissal of Reeza Hendricks when mounting a defense of their total. There are also a fair number of new faces in Sri Lanka's squad, but much like South Africa, it's the veterans who need to lead from the front. If Upul Tharanga can contribute runs at the top, if Thisara Perera can provide a little oomph to the lower-middle order, and if Lasith Malinga can strike early with the ball, Sri Lanka has more than enough young talent to fill in between, break a four-match losing streak and draw level in Centurion.